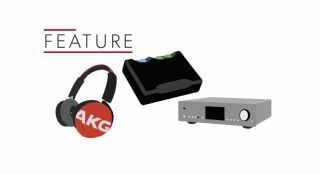 3 of the best hi-res audio systems | What Hi-Fi? Just starting to get into high-resolution audio? Or have you downloaded a fair few hi-res albums and are wondering how best to enjoy them? The good news is with more mainstream kit supporting hi-res formats than ever before, there are plenty of ways you can listen to your new tunes. Whether that’s based around the smartphone or laptop you use every day (paired with a great pair of headphones, of course), or building a dedicated hi-fi system, this guide will show you what’s possible at every budget - and how easy it is to get into superior sound quality these days. Have a smartphone? Of course you do. You likely listen to music, podcasts and radio shows through it on a regular basis when you’re out and about or on your daily commute. It may not be ‘hi-fi’, but smartphone-listening needn’t be the scourge of audiophiles anymore - flagship models are increasingly supportive of hi-res audio files. The beautifully designed Samsung Galaxy S8 is our top choice, as it can play hi-res files up to 24bit/192kHz PCM and even DSD128 tracks. Audiophiles, rejoice! We like the S8’s expressive and clear midrange and, with higher-quality recordings, its sense of detail and space shines. To really get the best out of your smartphone listening, you’re going to need a decent pair of headphones. And there’s no better way to start than with the ever-capable, ultra-affordable and portable AKG Y50s. Punchy, detailed and packed with enthusiasm, these £80 cans are a huge step up from bundled-in earbuds, and will have you bopping along to your portable hi-res music library. Want to finesse the audio quality even further? Add in a USB DAC - preferably the Cyrus soundKey - between your phone and headphones to hear greater refinement, space and clarity in your sound. It’s lightweight, and the included microUSB is thankfully short, so it doesn’t add too much weight or awkward dangling to your portable listening system. Yes, the soundKey does limit output to 24bit/96kHz, but this handy little gadget also works a treat for bringing the best from any CD-quality or Spotify tunes on your phone. Thin, fast and powerful, the Apple laptop (or equivalent computer) is the ideal place to store your hi-res files after you’ve bought them from your favourite download site(s). Any other laptop or computer will work of course - just make sure the music-playing software you use is compatible with hi-res audio. iTunes, for instance, doesn’t support hi-res or FLAC playback, even though the MacBook does - so you’ll have to buy additional software (such as PureMusic and Amarra for Mac, or JRiver Media Center for PC) to play your hi-res tunes. We wouldn't just rely on your computer's internal DAC (the audio circuits of which don’t tend to be optimised for sound quality) to do hi-res audio justice, either. Hand over all timing duties to an external DAC such as the excellent, multi-Award-winning Chord Mojo. Petite, portable and immensely talented, the Mojo is the ideal way to turn your computer into a genuine hi-fi source. And finally, the headphones. You can opt for huge, open-backed cans if you're staying put at home, but we're going to suggest something a bit more versatile (and not quite as leaky) so you can take your headphones into public spaces too. These lovely Sennheiser Momentum 2.0s are stylish, blessed with brilliantly detailed and rhythmically engaging sound, and they're comfortable to wear for hours on end. They're £100 less than their original price, too, but remain a cut above the competition. Their insightful sound ties in nicely with the Mojo's cohesive and precise presentation to create a simple but powerful hi-res desktop system that will barely take up space in your home (or on your desktop). Planning to build a serious hi-fi system at home? Is your hi-res music collection growing so wildly you’ve started storing music on dedicated NAS drives? Got a healthy budget to indulge your music obsession? Good. We have a delightful system for you. The knockout Cambridge Audio Azur 851N will play all your hi-res music (no matter where they’re stored) via multiple digital, analogue and wireless means. It’ll handle 24bit/192kHz streams over wi-fi and DSD64 via USB, and is seamless in use. Crucially, this premium streamer also sounds great: bone-rattling punch, class-leading insight and openness are all present in the full-bodied and balanced 851N. You’ll need a separate stereo amplifier and equally capable speakers to complete this hi-fi system. And we love this Moon and ATC combination. The ATC SCM11s remain unchallenged at the price, with no other standmounter coming close to their level of transparency and rhythmic cohesion. And they work a treat with this spellbinding new Moon 240i. They’re both revealing, subtle and terrifically agile, with the Moon’s smooth and fluid dynamics the perfect accompaniment to the SCM11s’ huge reserves of low-end depth and stunning midrange fidelity. This system may cost a pretty penny, but it's a beautifully composed hi-fi set-up that will keep you hooked on every song in your vast library.